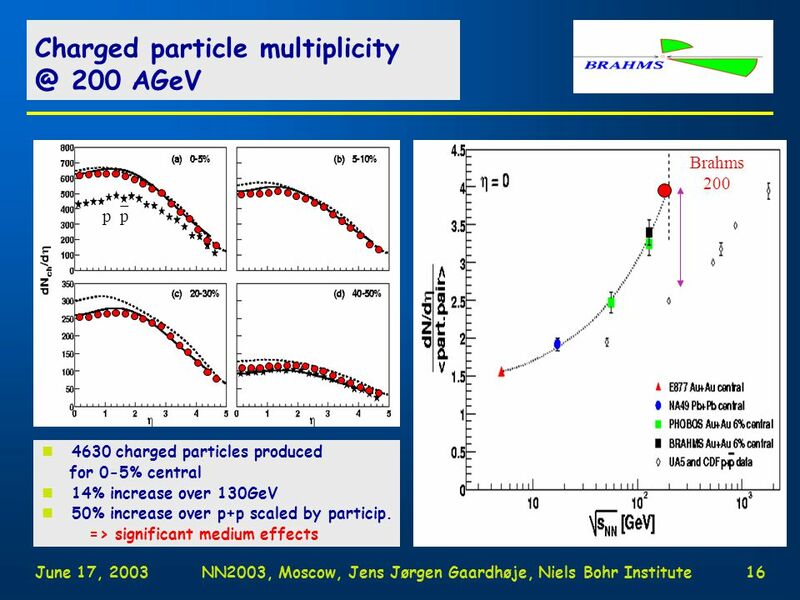 June 17, 2003NN2003, Moscow, Jens Jørgen Gaardhøje, Niels Bohr Institute1 n100 AGeV + 100 AGeV Au+Au Ecm =  s  40 TeV THE LITTLE BIG BANG and search. 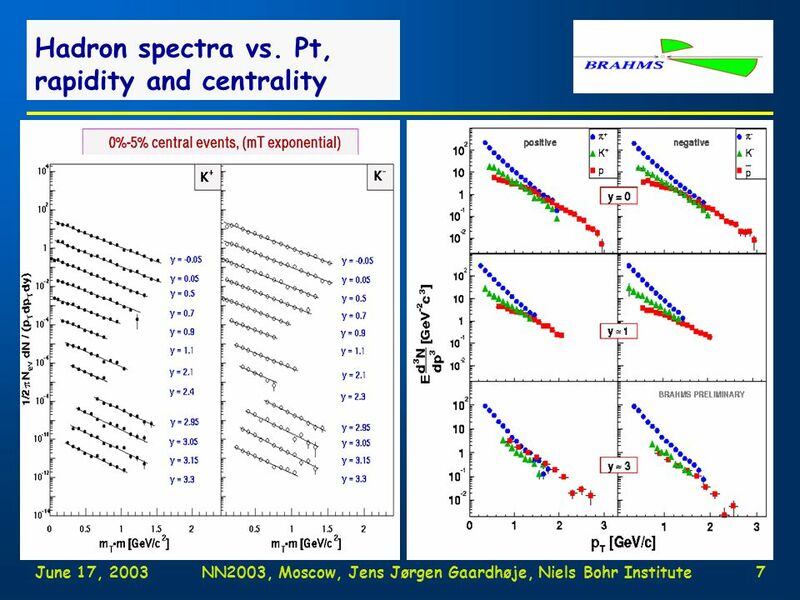 8 June 17, 2003NN2003, Moscow, Jens Jørgen Gaardhøje, Niels Bohr Institute7 Hadron spectra vs. Pt, rapidity and centrality a sample of Djamels spectra vs y f. eks pions. 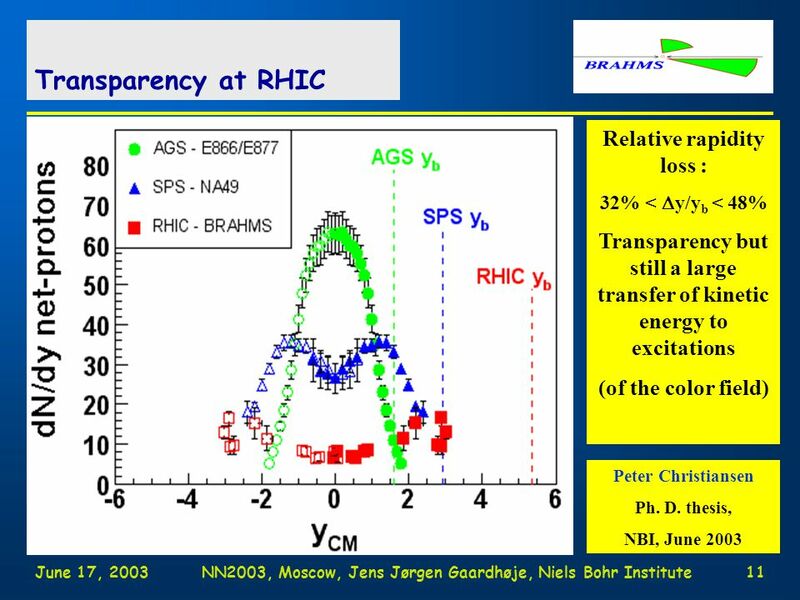 10 June 17, 2003NN2003, Moscow, Jens Jørgen Gaardhøje, Niels Bohr Institute9 Stopping or transparency at RHIC ? 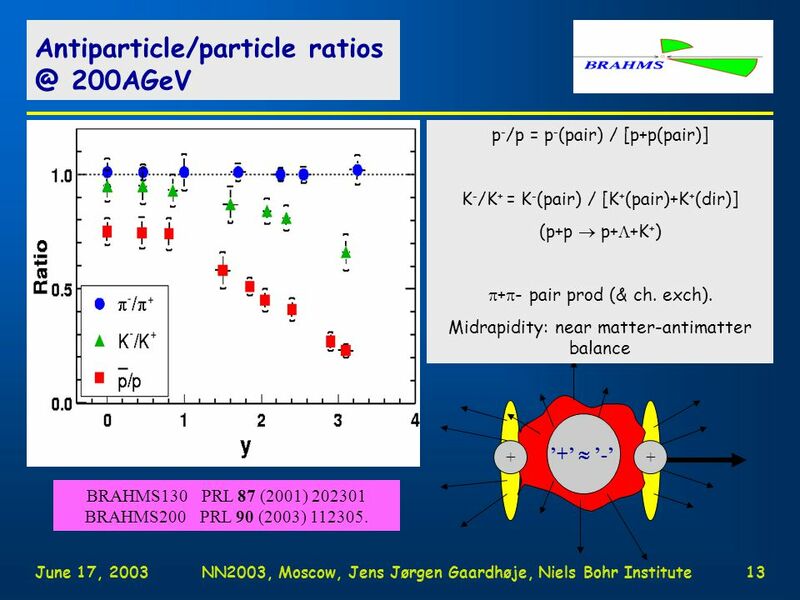 14 June 17, 2003NN2003, Moscow, Jens Jørgen Gaardhøje, Niels Bohr Institute13 Antiparticle/particle ratios @ 200AGeV ’+’  ’-’ p - /p = p - (pair) / [p+p(pair)] K - /K + = K - (pair) / [K + (pair)+K + (dir)] (p+p  p+  +K + )  +  - pair prod (& ch. exch). 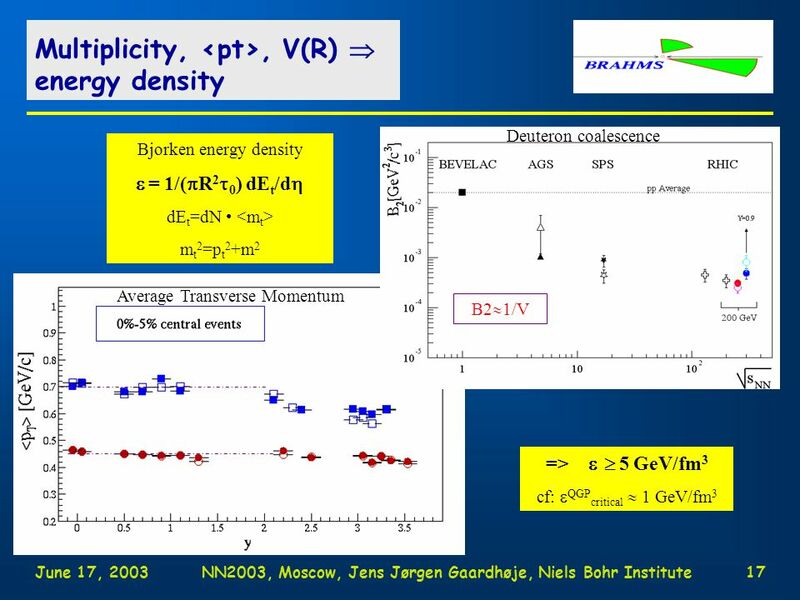 Midrapidity: near matter-antimatter balance ++ Boost Invariant Plateau ?! BRAHMS130 PRL 87 (2001) 202301 BRAHMS200 PRL 90 (2003) 112305. 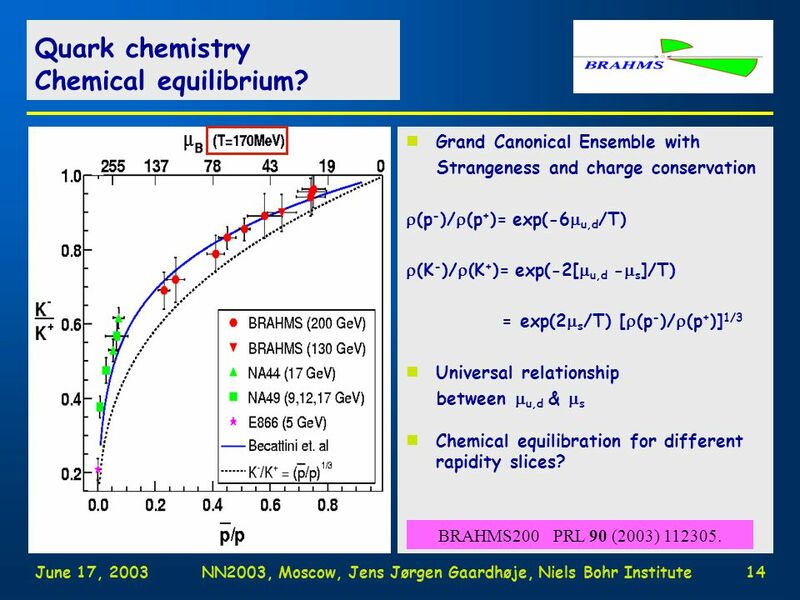 15 June 17, 2003NN2003, Moscow, Jens Jørgen Gaardhøje, Niels Bohr Institute14 Quark chemistry Chemical equilibrium? 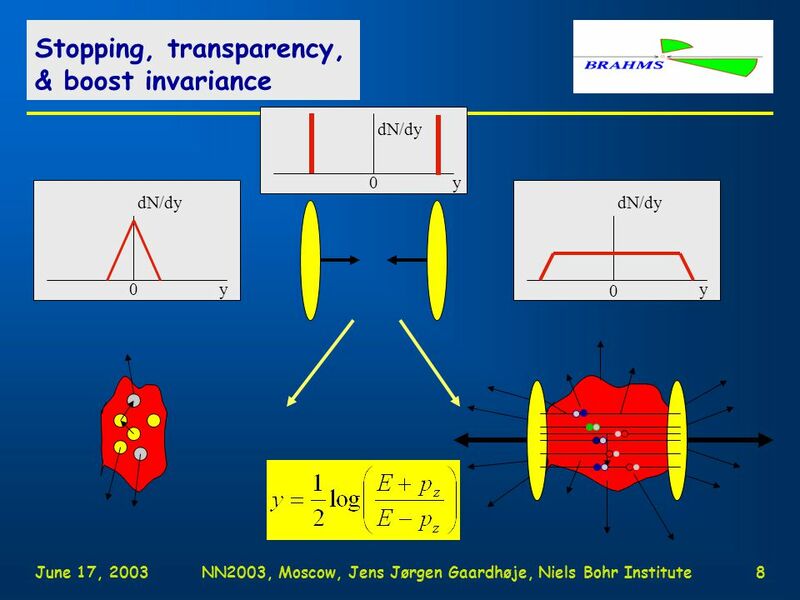 nGrand Canonical Ensemble with Strangeness and charge conservation  (p - )/  (p + )= exp(-6  u,d /T)  (K - )/  (K + )= exp(-2[  u,d -  s ]/T) = exp(2  s /T) [  (p - )/  (p + )] 1/3 nUniversal relationship between  u,d &  s nChemical equilibration for different rapidity slices? BRAHMS200 PRL 90 (2003) 112305. 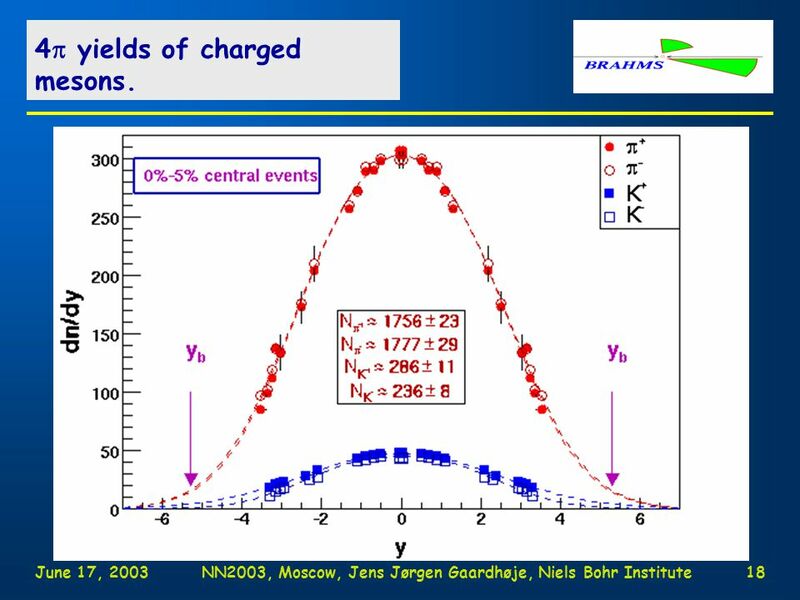 19 June 17, 2003NN2003, Moscow, Jens Jørgen Gaardhøje, Niels Bohr Institute18 4  yields of charged mesons. 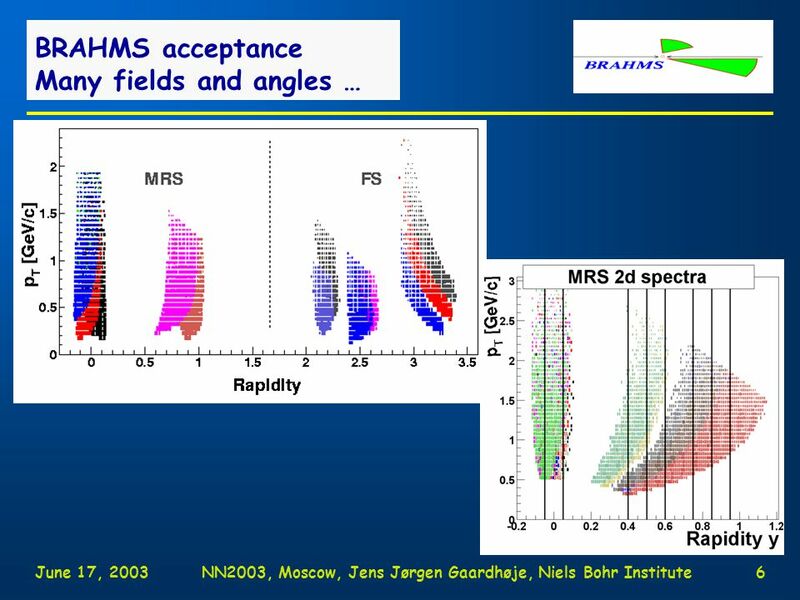 23 June 17, 2003NN2003, Moscow, Jens Jørgen Gaardhøje, Niels Bohr Institute22 Jet Quenching? High pt yield suppression. 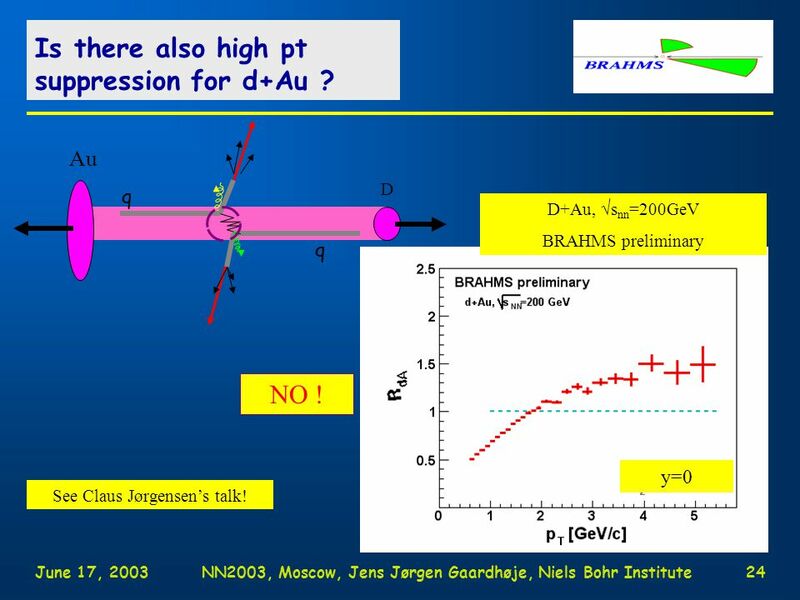 25 June 17, 2003NN2003, Moscow, Jens Jørgen Gaardhøje, Niels Bohr Institute24 Is there also high pt suppression for d+Au ? 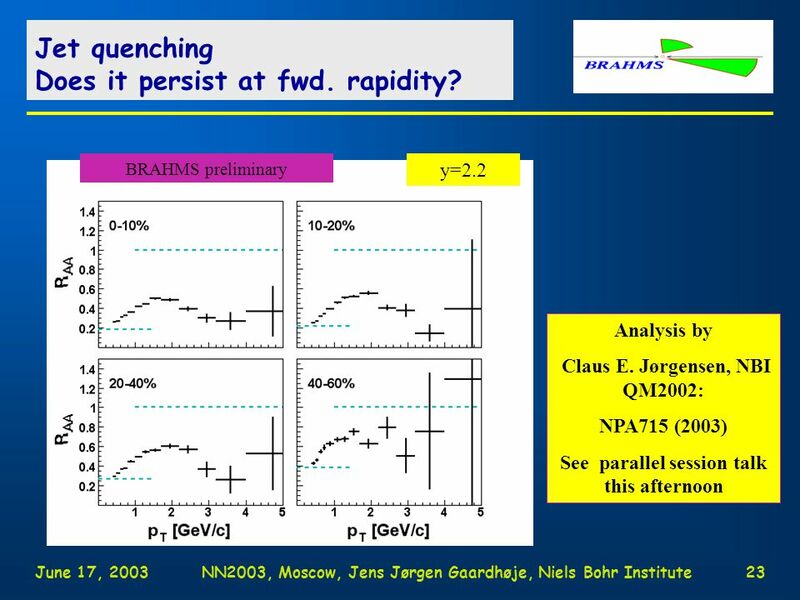 q q Au D D+Au,  s nn =200GeV BRAHMS preliminary See Claus Jørgensen’s talk! y=0 NO ! 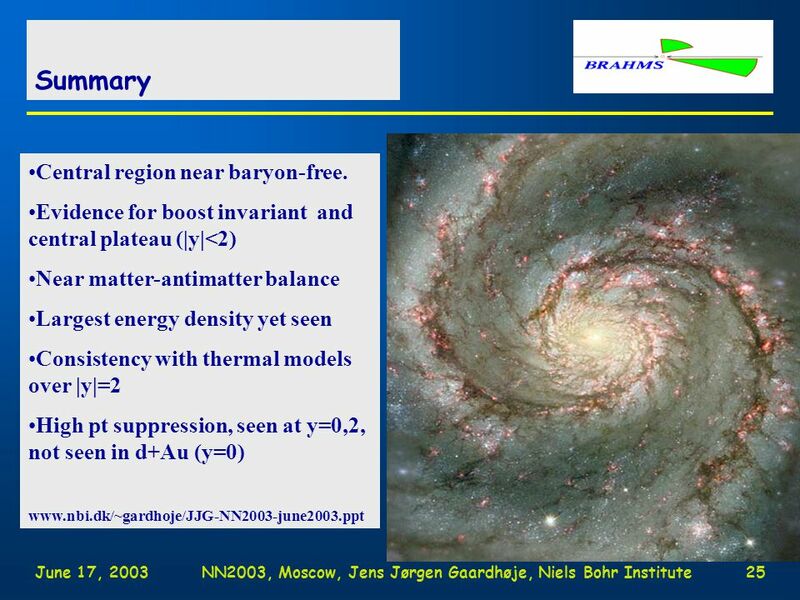 Download ppt "June 17, 2003NN2003, Moscow, Jens Jørgen Gaardhøje, Niels Bohr Institute1 n100 AGeV + 100 AGeV Au+Au Ecm =  s  40 TeV THE LITTLE BIG BANG and search." 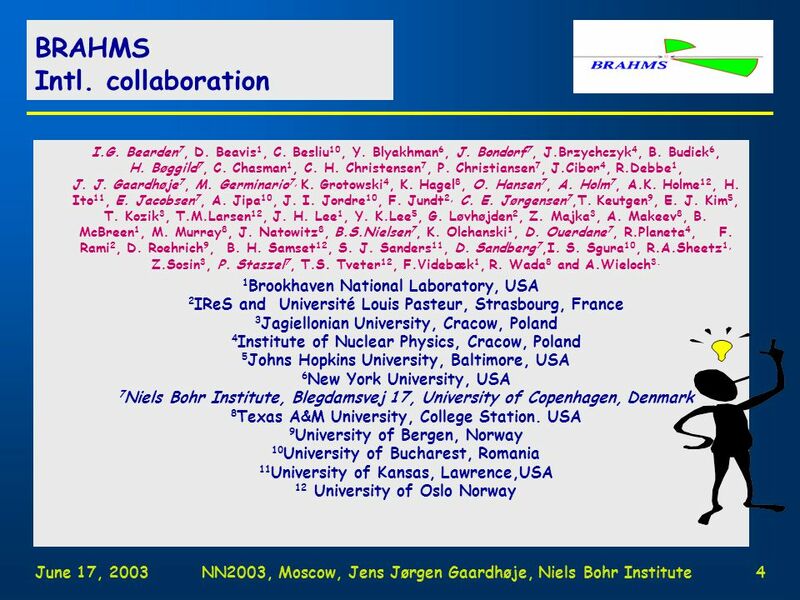 Results from BRAHMS experiment at RHIC Pawel Staszel Niels Bohr Institute for the BRAHMS Collaboration. 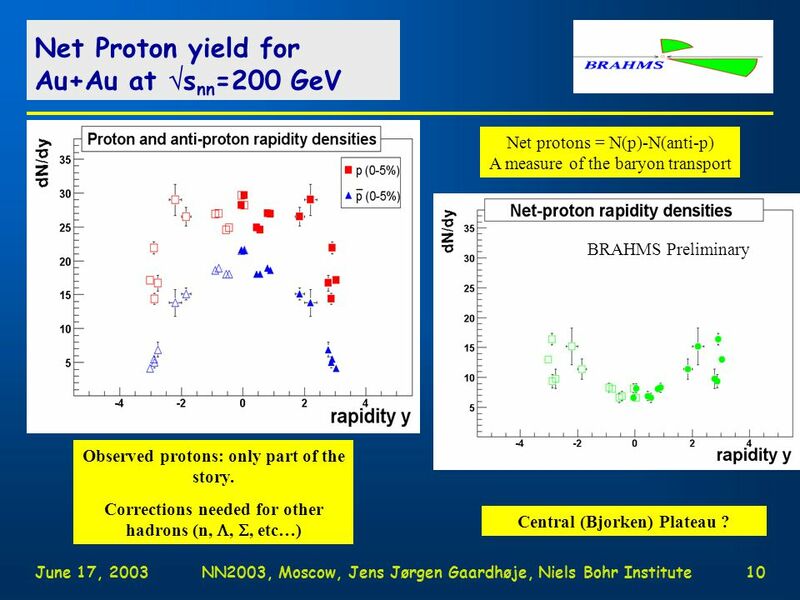 Dec 6, 2001BH-symposium, Jens Jørgen Gaardhøje, Niels Bohr Institute1 nFirst physics at RHIC with 65 AGeV + 65 AGeV and 100 AGeV AGeV Au+Au collisions. 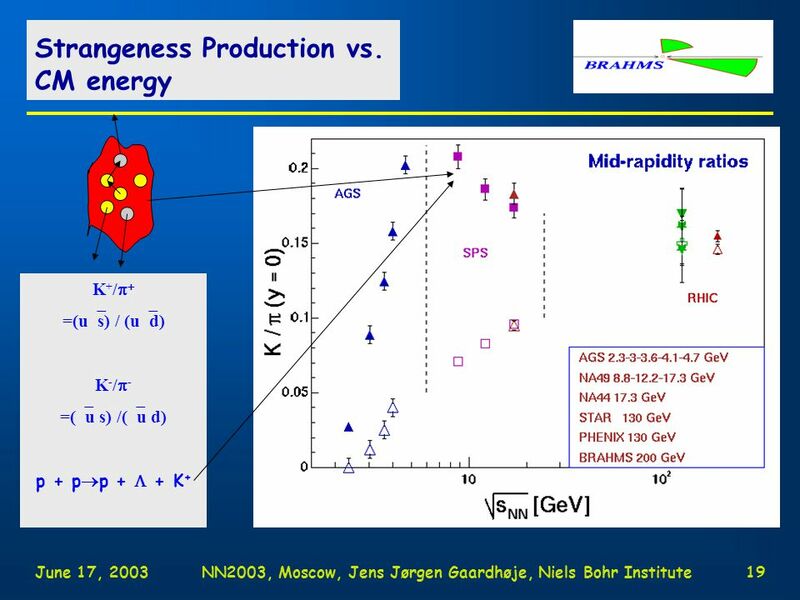 Mass, Quark-number, Energy Dependence of v 2 and v 4 in Relativistic Nucleus- Nucleus Collisions Yan Lu University of Science and Technology of China Many. 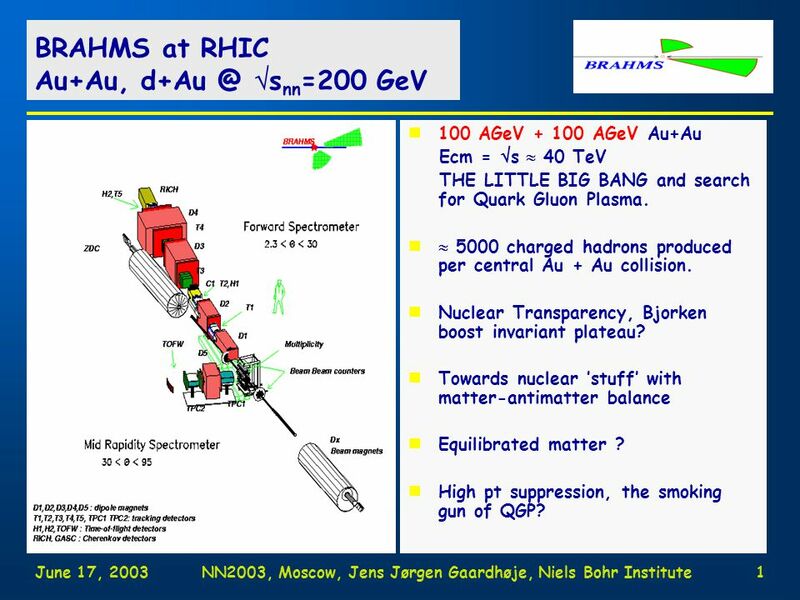 RHIC AGS Users Meeting 12 May BRAHMS Highlights Ramiro Debbe for the BRAHMS collaboration Physics Department. 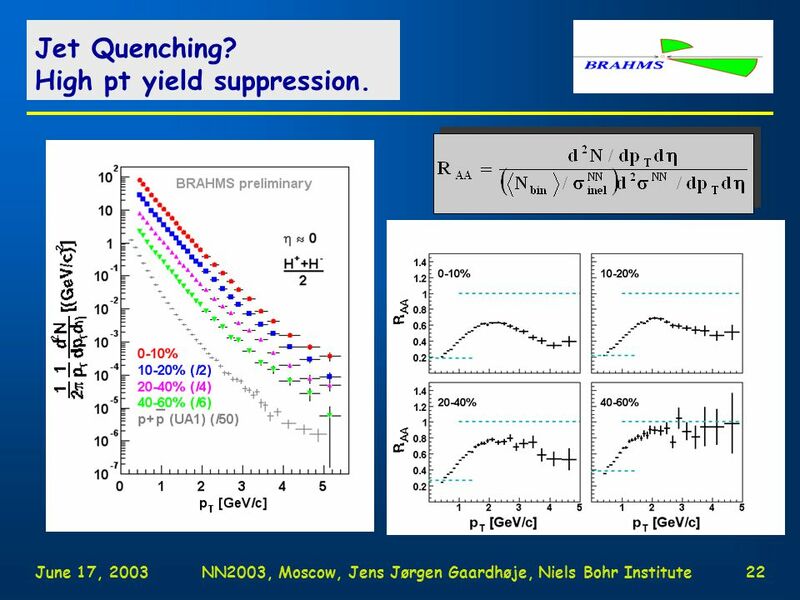 High p T Suppression at Forward Rapidities Catalin Ristea Niels Bohr Institute, Copenhagen for the BRAHMS Collaboration XXXV International Symposium on. 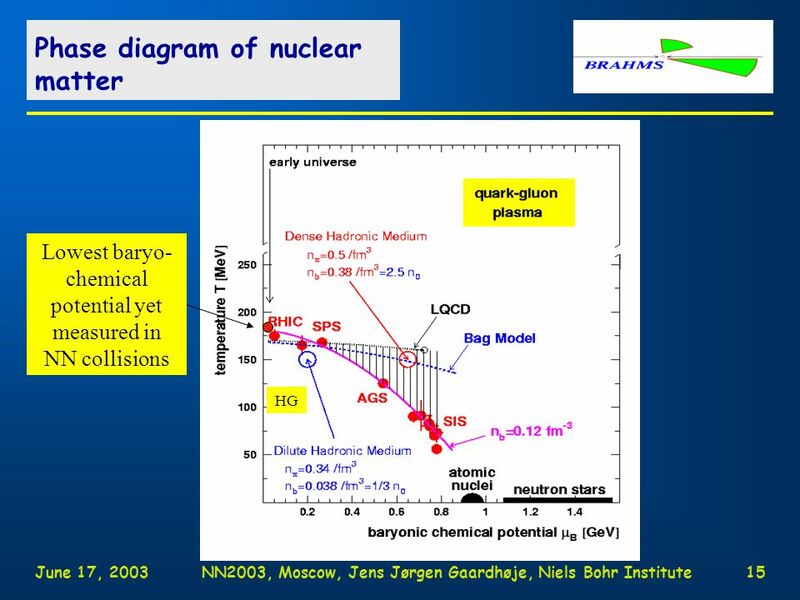 June 17, 2003NN2003, Moscow, Jens Jørgen Gaardhøje, Niels Bohr Institute1 n100 AGeV AGeV Au+Au Ecm =  s  40 TeV THE LITTLE BIG BANG and search. 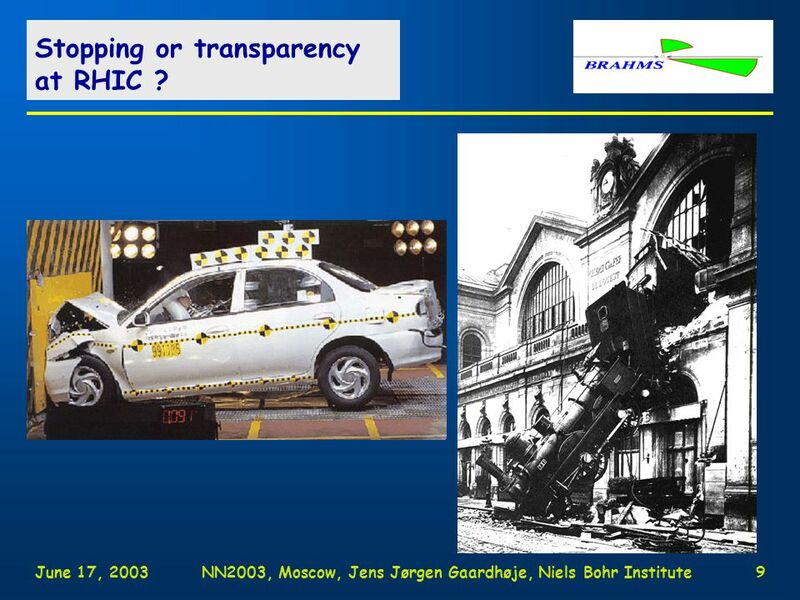 Sept 4, 2001Paris, Jens Jørgen Gaardhøje, Niels Bohr Institute1 nReaction features in 65 AGeV + 65 AGeV and 100 AGeV AGeV Au-AU collisions nEM dissociation. Michael Murray1 Global Detectors Flavor Dynamics Michael Murray for BRAHMS C. Arsene 12, I. G. Bearden 7, D. Beavis 1, S. Bekele 12, C. Besliu 10, B. Budick. 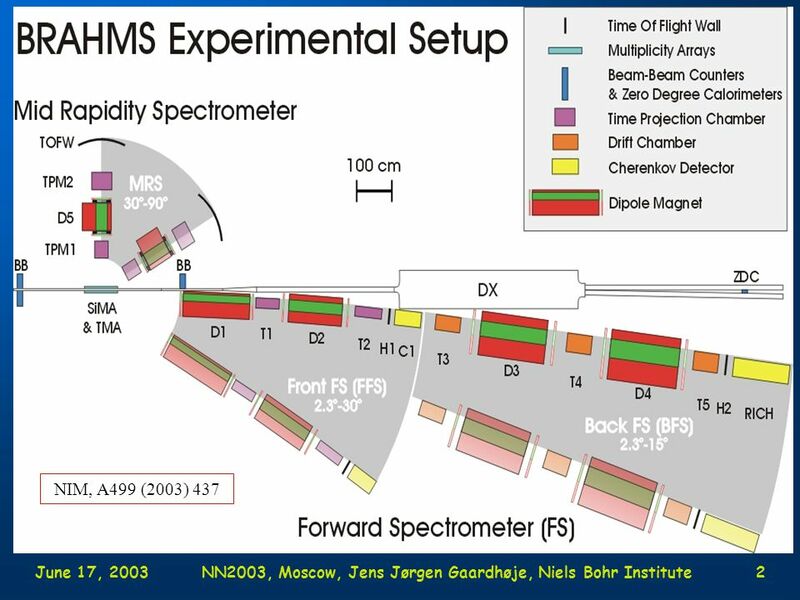 A probe for hot & dense nuclear matter. Lake Louise Winter Institute 21 February, 2000 Manuel Calderón de la Barca Sánchez. 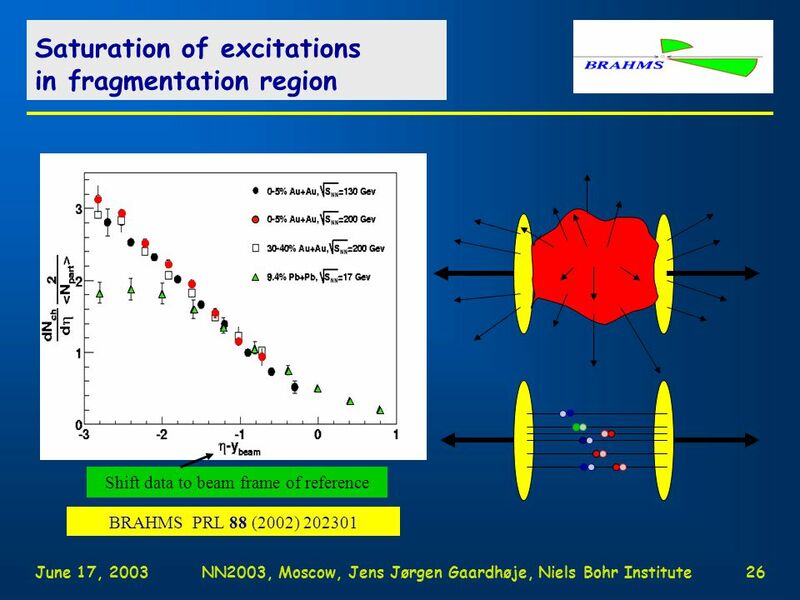 Particle Production in p + p Reactions at GeV K. Hagel Cyclotron Institute Texas A & M University for the BRAHMS Collaboration. 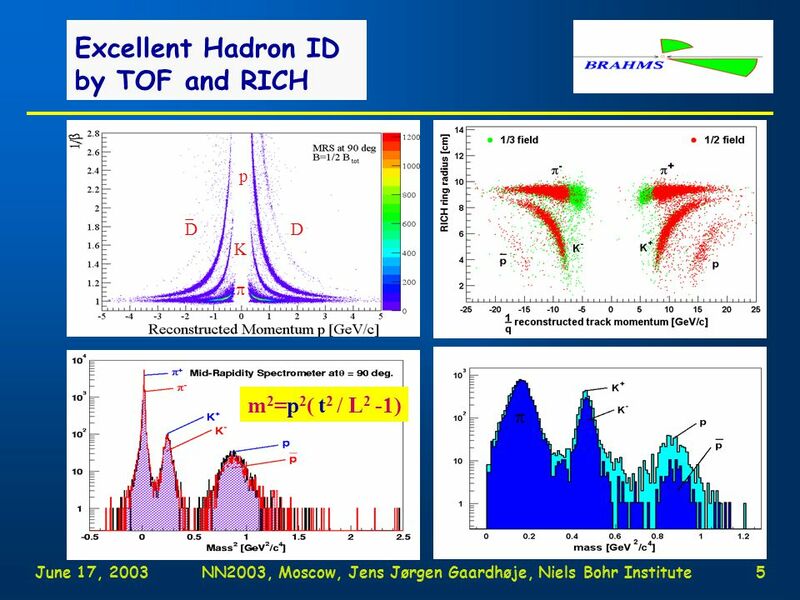 Baryon-to-meson production in a wide range of baryo-chemical potential at RHIC Paweł Staszel, Marian Smoluchowski Institute of Physics Jagiellonian University. 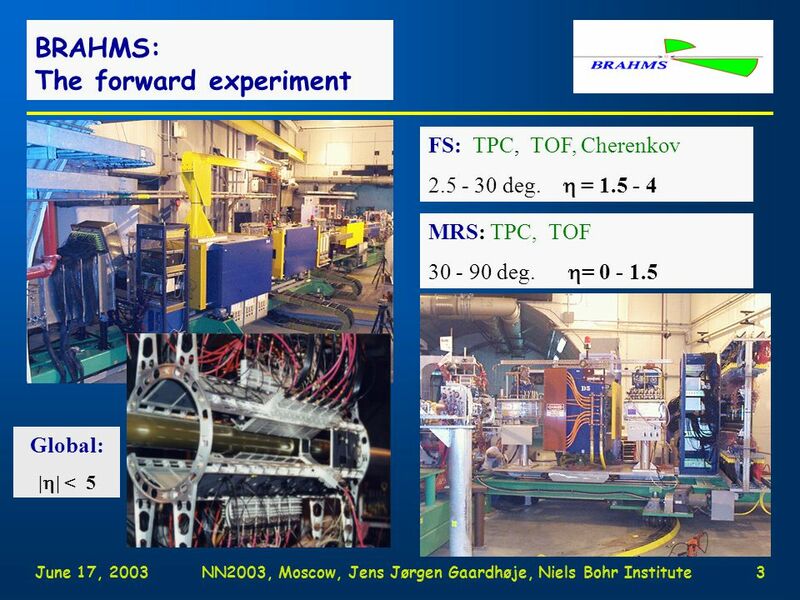 Phases of matter in the BRAHMS experiment Paweł Staszel, Marian Smoluchowski Institute of Physics Jagiellonian University for the BRAHMS Collaboration. 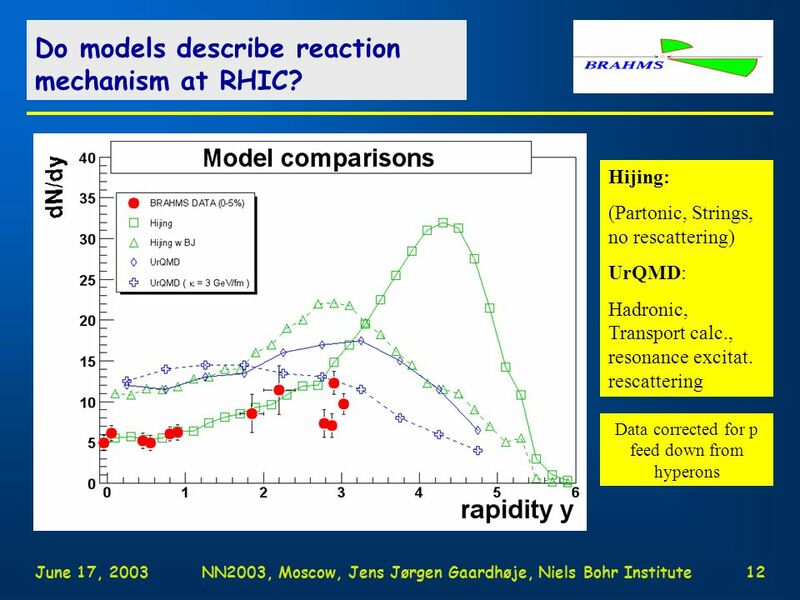 5-12 April 2008 Winter Workshop on Nuclear Dynamics STAR Particle production at RHIC Aneta Iordanova for the STAR collaboration. 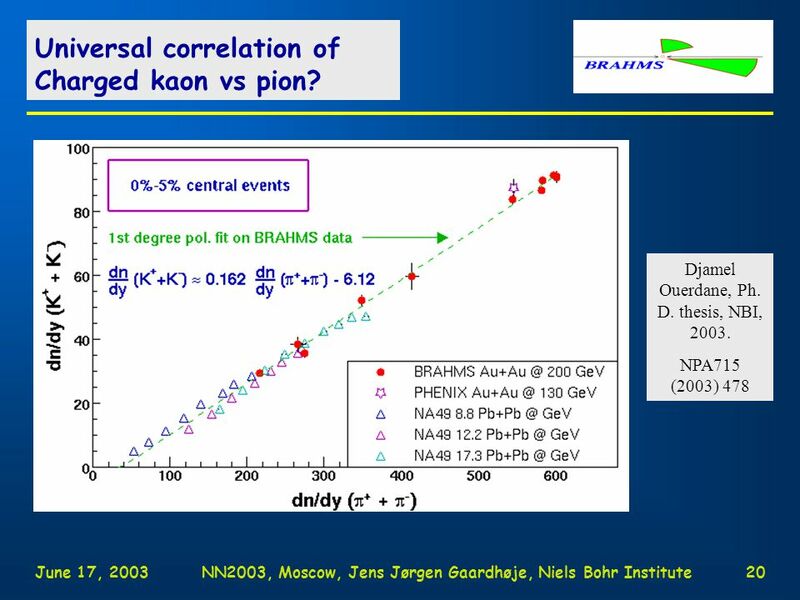 Winter Workshop, Big Sky, February 121 Flemming Videbaek Physics Department, BNL What did we learn from 200 and 62 GeV pp collisions at RHIC ? A BRAHMS. J.H. Lee BNL Correlations Fest, June 2002, BNL HBT in BRAHMS. 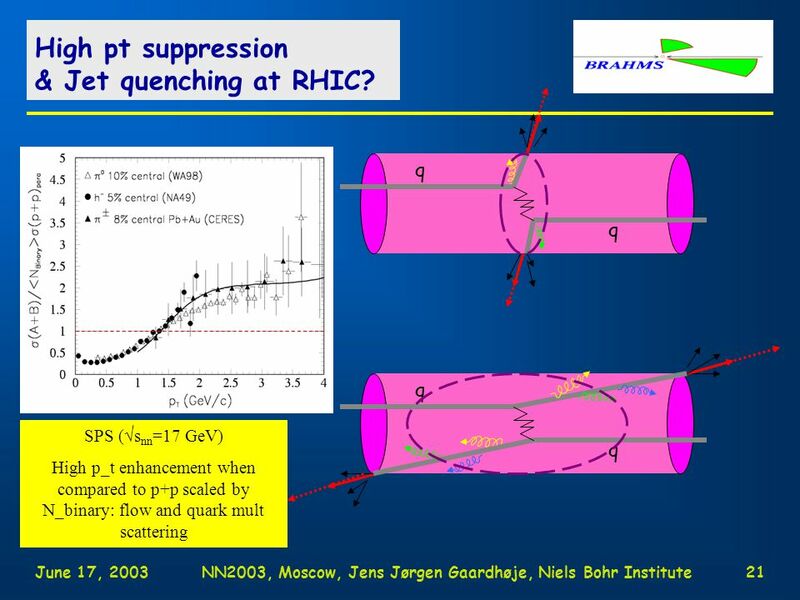 1 Jeffery T. Mitchell – Quark Matter 2012 - 8/17/12 The RHIC Beam Energy Scan Program: Results from the PHENIX Experiment Jeffery T. Mitchell Brookhaven.